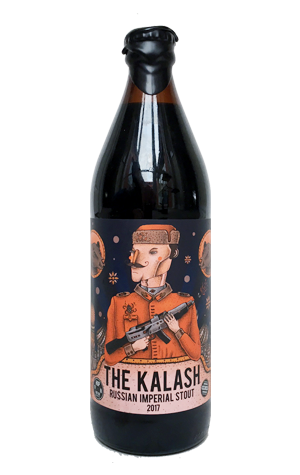 With a name like The Kalash and an image of an armed soldier on the label, you'd expect there to be no messing with this beer. And that's certainly the case. Hop Nation duo Sam and Dunc put the base beer for the second vintage of their Russian imperial stout into bourbon and Port barrels (last year's went into Pinot Noir barrels, just so you know), where it spent months ageing before being blended into the final beer. And it's a big one. Tipping the scales at 10.2 percent ABV, this year's Kalash is a thick, oily drop, topped by a thin brown head. The time in barrel has added some smoothing, drying oak characters, while we reckon there's a hint of bourbon spice in there too. Aside from that, it sits towards the middle of the spectrum, little in the way of sharper, bitter roasted characters, not too much sweetness, no overt boozy heat, instead a full bodied, chocolatey, earthy imperial stout. NB If you're reading this in time you can try it three ways here.